“It was the best of times, it was the worst of times.” The iconic opening to A Tale of Two Cities by Charles Dickens could’ve described the Houston area during Hurricane Harvey. The cataclysmic event of wind and water tested the Bayou City and surrounding communities, spawning powerful stories of heroism, help and the human spirit. Leadership is paramount in times of trial. Throughout Harvey, people needed information, direction and support. 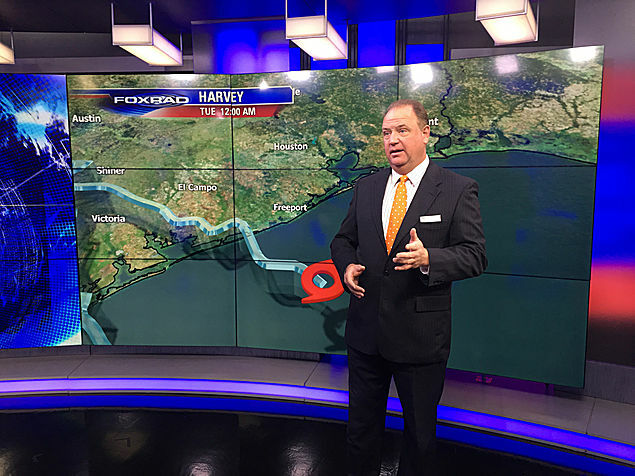 Fox New 26 Chief Meteorologist and Katy resident Jim Siebert provided it through television broadcasts, Facebook Live dialogues and Twitter Q & A. Alongside weekend and morning forecasters, the team worked in eight-hour shifts to cover air time and engage the public personally. 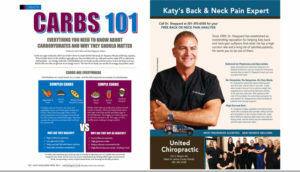 “Hundreds of thousands on Facebook needed help with specifics for their areas, and we offered feedback,” says Dr. Jim. The overriding message on every front was: Be calm, be alert, be wise. Foreseeing trouble, Dr. Jim booked into a hotel near the news station for a week and aimed for six hours of sleep a night. Fox 26 is prepared for extreme situations and can actually house employees for a month. There are cots and supplies, including generators and fuel. Dr. Jim kept up with family through texts. “The worst part of my job is leaving my family.” The Sieberts have a plan to stay safe, and friends support them in the Dr. Jim’s absence. Social media played an integral part in spreading information and personalizing support efforts throughout the hurricane. It also allowed Dr. Jim and team to talk to people in their homes and offer the latest news. Sometimes, bad information was posted by trolls, like the photoshopped shark on the West Park Tollway, but at other times, it was more subtle. This created some fear and skepticism. “The good far outweighed any bad,” he says. In the storm’s aftermath, one Katy family with horse property near George Bush Park had no electricity or access. They made a Facebook plea for help. A friend of a friend of a friend connected and brought a boat to help with the family and horses. The family, then turned around, and assisted others. 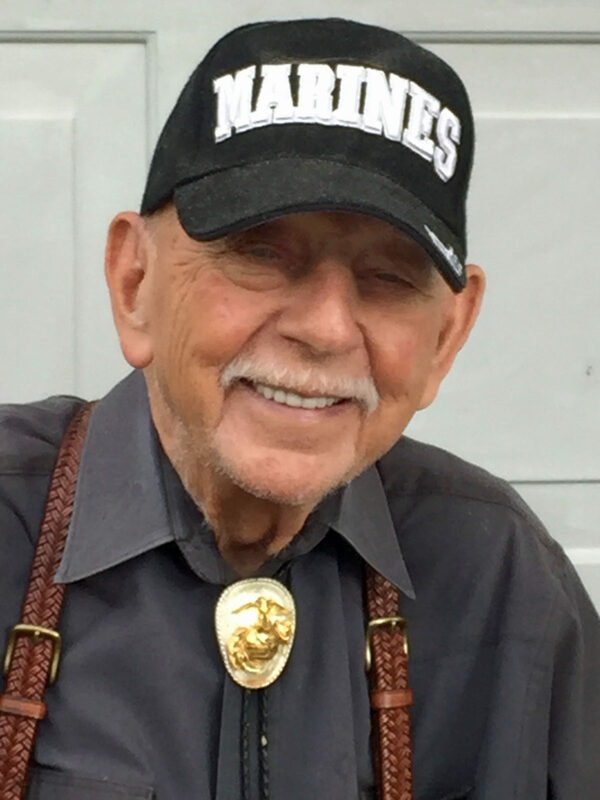 “It’s so very Texas, and there are thousands of stories like that,” says Dr. Jim. 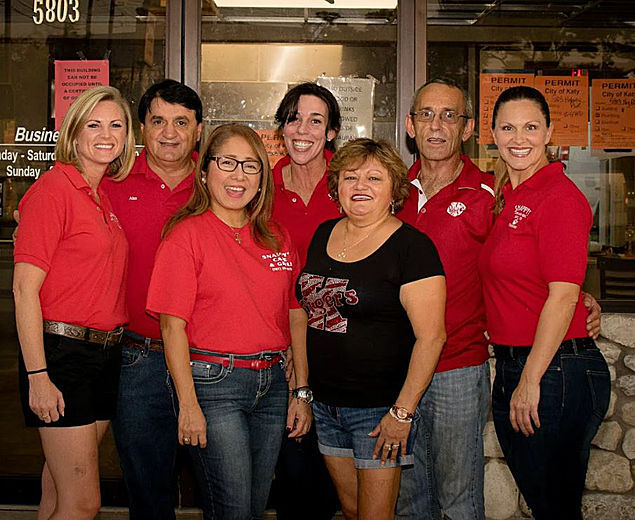 After extensive damage due to Hurricane Harvey, staff members, friends, and city officials roll up their sleeves to rebuild and re-open the iconic cafe in historic Katy on October 30, 2017. When Hurricane Harvey hit Houston on August 25th, it was a double-whammy for Snappy’s Cafe & Grill. The breakfast and lunch spot is a landmark in the original downtown with a wide range of customers from city officials to industry workers and including Katy Magazine. The flood waters rose to more than four feet, and partners Bobby Katsabas and Alex Tsounakas faced a rigorous recovery. It was the second time in as many years that Snappy’s had suffered flood damage. The first event was Tax Day 2016. Several inches of water saturated the premises then, but Harvey dealt a brutal blow. “Everything was destroyed,” Bobby says. “We had to throw everything out, start from scratch and rebuild.” With only the inspections left to complete, the good news is that the go-to place for biscuits and gravy is slated to reopen on October 30, 2017. Once open, Snappy’s would like to let the community to know that the restaurant will now be 100% smoke-free. In a storm so fraught with destruction, the best of the city responded, especially diners to whom Snappy’s has become as familiar as family. 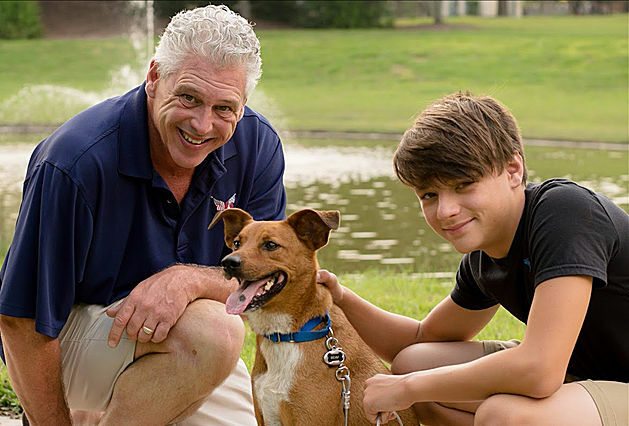 This Katy family had given up hope on ever finding their beloved rescue pup, Beau. Three years after he disappeared, they got a call they never expected. The family had owned two dogs when they moved to Katy in 2005, but they grew old and passed on. Sons Andrew and Collin, of course, missed their four-legged friends. “In January 2012, after a year of grieving, and another year of nagging from the boys,” Michael said with a laugh, “we got another dog.” The LaBountys visited Citizens for Animal Protection, a private, non-profit outfit that offers shelter, foster care, adoption and other services. They chose Lucky, a three-month-old pup, believed to be a mix of Rhodesian ridgeback and chow. They renamed him Beau. It was instant affection all around, especially for Collin, still in grade school. “He was so attached—they were like brothers—and he found comfort in Beau,” Michael said. The smart puppy was quickly housebroken, and learned to sit and shake hands. Beau was skittish of bad weather and new people, and this fear explained how he could become lost and stay lost for so long. Beau was an inside-outside dog, and on Friday, March 28, 2014, the family went out to celebrate a friend’s birthday. They left the dog in the yard, but an approaching storm blew open the gate. A neighbor saw Beau bolt, but couldn’t retrieve him. She was frantic when the LaBountys returned. “A cavalry of friends spent a weekend looking for Beau,” Michael said. They posted on Facebook and Lost Pets, hung flyers, visited shelters and called around. It was an intense search, but Beau was truly lost. Then, calls came in to report a dog. Each time, Michael’s heart leapt, and he dropped everything to follow up. He spent hours searching shelters and areas where the dog had been spotted. This continued for two years. After a year, Andrew and Collin began an earnest campaign for another dog. The family visited Special Pals, Houston’s longest running no-kill shelter and adopted a 50-pound black lab. Zeus was a year old. Soon after, the phone rang with the happy news about Beau. 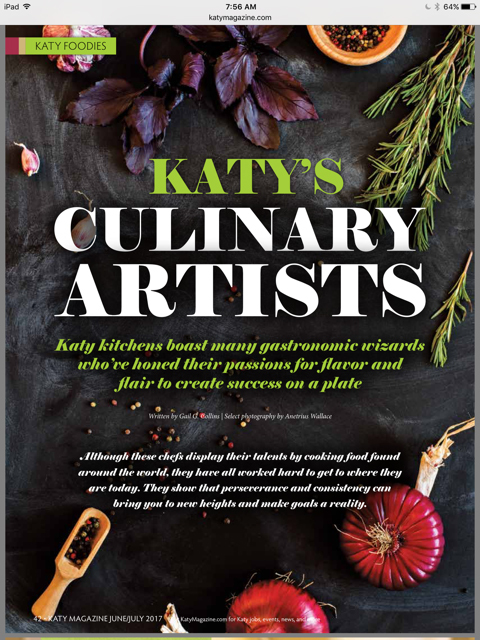 Katy kitchens boast many culinary wizards, who’ve honed their passions for flavor and flair to create success on a plate. Although these chefs display their talents by cooking food found around the world, they have all worked hard to get to where they are today. They show that perseverance and consistency can bring you to new heights and make goals a reality. It’s hardly surprising that Chef Christo Batsios would own and operate an Italian restaurant with his father Georgio. As a Greek-Italian immigrant, Georgio owned three restaurants in Michigan, where Chef Christo grew up. Generations before him had run restaurants, and at 4 years old, Batsios sat on a milk crate peeling potatoes and onions. After a culinary education and work in Italy and Greece, Batsios joined HEB to butcher and progressed with the company. His dreams soon turned to longing for a restaurant, and Georgio emerged from retirement with Landry’s. An Italian brasserie with a struggling menu was found and infused with legacy recipes, like Pomodoro sauce and slow-roasted beets with lamb shanks. “I love to feed people, and every guest is coming to our home for dinner,” Batsios says. His goal is overachieving in flavor—sapore—with service and presentation of rustic dishes dressed in signature sauces. Getting up before dawn and prepping is a joy. The journey from his humble roots to technical cooking skills is satisfying, and new wife Cassie supports his passion. 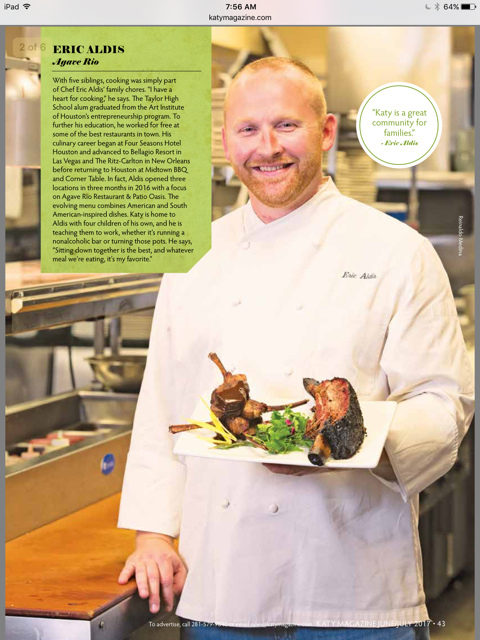 This chef trekked from El Paso to Katy in the search of the best job and life. Raul Carrillo finalized a culinary education at the Art Institute in 2004. Explaining his career shift, he says, “I liked cooking, and everyone like the way I cooked.” His grandmother and mother appreciated the kitchen arts, and Carrillo still calls his mom for recipe checks. He is hard at work when everyone else is playing though—weekends, celebrations, and holidays—so he never cooks at home. “My wife says my food isn’t simple, and I use too many pans,” he jokes. The humble chef doesn’t seek glory, and is happy to know people relish the food and will return. Like most chefs, he delights in chatting with patrons and collects honest feedback to improve the menu. The interaction is a return to his Cooking Connection days at HEB. Perhaps, that is the secret to recent success all around. 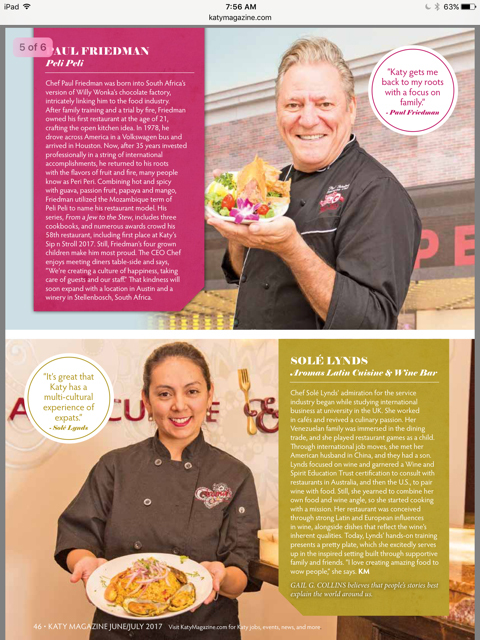 The Cellar Door needed a kitchen revamp, and Chef Raul advanced to executive chef and turned it around. 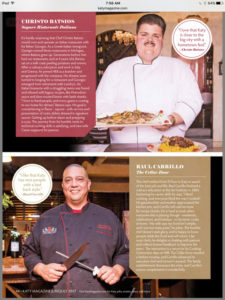 The family establishment showcases the wine, and Carrillo’s cuisine compliments it wonderfully. Paul Friedman was born into South Africa’s version of Willy Wonka’s chocolate factory, inextricably linking him to the food industry. After family training and a trial by fire, Friedman owned his first restaurant at the age of 21, crafting the open kitchen idea. In 1978, he drove across America in a Volkswagen bus and arrived in Houston. Now, after 35 years invested professionally in a string of international accomplishments, he returned to his roots with the flavors of fruit and fire, many people know as Peri Peri. Combining hot and spicy with guava, passion fruit, papaya and mango, Friedman utilized the Mozambique term of Peli Peli to name his restaurant model. His series, From a Jew to the Stew, includes three cookbooks, and numerous awards crowd his 58th restaurant, including first place at Katy’s Sip and Stroll 2017. Still, Friedman’s four grown children make him most proud. The CEO Chef enjoys meeting diners table-side and says, “We’re creating a culture of happiness, taking care of guests and our staff.” That kindness will soon expand with a location in Austin and a winery in Stellenbosch, South Africa. Bio: Gail G. Collins writes for magazines with three books on international life, believing people’s stories best explain world around us. Working out as a couple offers time together, accountability, and ultimately, success for these dynamic duos. Four couples share their motivation and advice on how to get fit and stay fit, despite demanding careers, kids’ activities and life’s obstacles. They have found fitness maintains the best quality of life. Ages: Jeremy 40 yrs. ; Clarissa 35 yrs. In 2015, when Jeremy and Clarissa Browning took a hard look at themselves, they saw the exact opposite of everything they used to be. Jeremy had played college baseball and coached, while Clarissa once danced ballet. “We were lethargic, restless, and fueling our bodies poorly, which affected our physical, mental, spiritual, and emotional selves,” says Jeremy. The couple vowed to become their best and healthiest selves. That commitment led them to investment in six Iron Tribe Fitness franchises, stressing proper nutrition and intelligent fitness for sustainable change. High intensity interval training provides them with a safe, fast-paced, varied workout. While coaching others, Jeremy lost 43 pounds, and Clarissa regained her strength with optimal body fat composition, even after pregnancy. They find inspiration in wanting to share a long life with their son, Boston. “We both feel it is a sign of gratefulness and self-respect to eat clean and workout consistently,” says Clarissa. Children: Ryan and Quinn 7 yrs. Consumed with life after the birth of her twins, Meagan stopped exercising. Despite having been a collegiate athlete, she panted her way up the stairs. When the children headed to kindergarten, she found a nearby gym and no more excuses. Matt had consistently worked out at home, but they joined as a family pledge. Now, they crave the workouts, scheduling partner sessions as friendly competition when possible. “It’s one hour we can have that’s just for us,” says Matt, and it fuels other areas of their busy lives. The couple has gained lean muscle mass and improved their eating habits, yet find balance—no Cheetos, but a nice glass of wine. Accountability is vital and goal-setting—like finishing a quarter-marathon for Meagan and more energy for Matt’s demanding job—drives them. “We are a healthier couple, but also a happier couple,” she says. Ages: David 42 yrs. ; Kristen 41 yrs. Children: Olivia 9 yrs. ; Garrett 7 yrs. David and Kristen Hewitt lost their fathers when the men were in their 50’s. The couple needed to stay healthy for their children, so they joined a gym. Classes with cardio and strength components that change and challenge them, while emphasizing form and mechanics, are their favorite. These include modifications for Dave—who lost his leg below the knee in a motorcycle accident followed by knee and hip surgery—to expand his mobility and technique. This improved Dave’s gait with a prosthetic limb and lessened his medications. In the past seven months, he lost 25 pounds, and Kristen traded in 20 pounds for a leaner body and ramped up muscle. Big changes in food and family activity accompanied their fitness regime. “Eighty percent of it is diet—make small changes that stick,” says David. Kristen adds, “We have more energy, we are sleeping better, and just feel better overall.” Accountability and togetherness assured their success. Chad and Brittani Morales are fitness coaches and compete in Crossfit competitions, but they face the same obstacles to a healthy lifestyle as everyone else. “You can’t out-work a bad diet,” says Brittani. “To see results, you have to make some sacrifices, have a plan, and stick with it.” Weekly, she organizes meals ahead to avoid inevitable time-crunches. Bio: Gail G. Collins writes for magazines, has authored three books on life abroad and believes meeting people is the best way to understand the world. When a Texas A&M undergrad in biology signed up for a rusty professor’s microbiology class, her life’s work came into focus. Today, Dr. Linda Yancey is a rarity, where only a handful of the women studying internal medicine go on to become infectious disease specialists (IDS). She also holds a position as chief of staff, where the demographics of executive positions have been slow to shift to women. Dr. Yancey graduated from medical school at Texas Tech in 1996 and did her residency at Arizona’s Mayo Clinic. She returned to Texas for a fellowship at Baylor after the birth of her first child. The new doctor moved down the street from her in-laws and had three more children, calling Katy home. 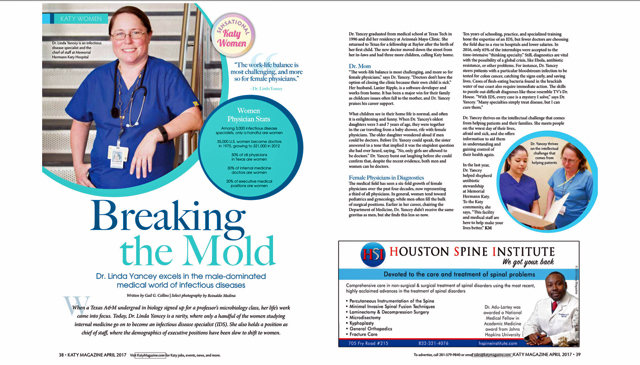 “The work-life balance is most challenging, and more so for female physicians,” says Dr. Yancey. “Doctors don’t have the option of closing the clinic because their own child is sick.” Her husband, Lanier Ripple Jr., is a software developer and works from home. It has been a major win for their family as childcare issues often fall to the mother, and Yancey praises his career support. What children see in their home life is normal, and often it is enlightening and funny. When Yancey’s oldest daughters were 5 and 7 years of age, they were together in the car traveling from a baby shower, rife with female physicians. The older daughter wondered aloud if men could be doctors. Before Dr. Yancey could speak, the sister answered in a tone that implied it was stupidest question she had ever heard, saying, “No, only girls are allowed to be doctors.” Dr. Yancey burst out laughing before she could confirm that, despite the recent evidence, both men and women can be doctors.